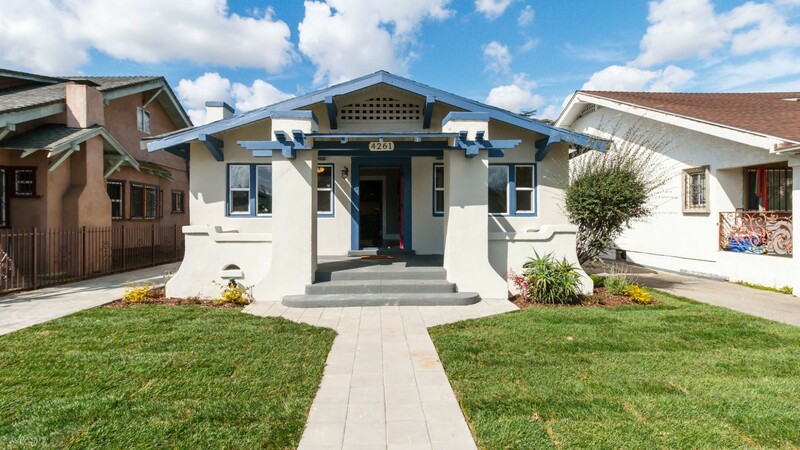 Welcome to this gorgeous remodeled California-style bungalow that combines both its vintage character with beautiful modern upgrades! This area is quiet, green lawns to your left & right. As you are driving up, there is no doubt of the stunning curb appeal displayed by the stunning newly planted front lawn. This 3 bedroom 2 bath home provides an open functional floor plan with an adjoining kitchen, dining, living area. Imagine the family unity here, it's not only convenient to have the living & dining room located off of a kitchen, the connected space allows for a fun & open integration of the three spaces. The kitchen provides fully customized cabinets, quartz counter tops & conveniently neighbors the inside laundry service porch. A gallery of new dual pane windows, crown molding, new roof, new wood laminate flooring flows throughout, master bedroom is complete with en suite bathroom, central AC/HVAC, and two-tone interior/exterior paint make this home the perfect investment for you! Plus a 2 car detached garage that is conveniently accessed from the new concrete driveway & an attached recreational room that can be personalized to meet the current ADU ordinance, endless possibilities here! Location is unmatched: walking, biking, & driving distance to LA Coliseum, LAFC Soccer Stadium-The Fields, USC Village-Trader Joe's, museums including future Lucas Museum, freeways & short commute to DTLA-LA Live, Arts District, Baldwin Hills Mall, Culver City, South Bay neighboring Cities.